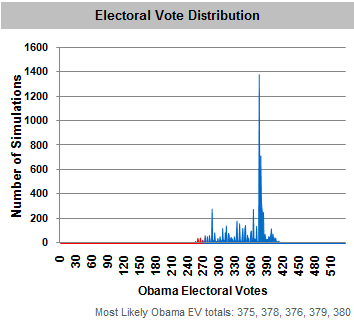 ... which is to say, in nearly 1400 simulations, Obama gets 375 electoral votes. The total possible is 538 (hence the name of the site); it takes 270 to win the election. The other crystal ball is the Intrade prediction market, where real money is bet on each state's electoral vote. Intrade has been shockingly accurate, from predicting each state Bush won in 2000 to the super-secret selection of the Pope. Both site show a solid Obama electoral win, and have for a month now. They could be wrong, and they will certainly adjust as we get closer to the election. But in September, a landslide was not a part of our equation; it is now. Voter turnout could break records, at a moment when voting machines are untested in many states -- such as, surprise, Florida. Any case of voting failure, no matter what your political leaning, is a story in a democracy and an echo to 2000. But FiveThirtyEight's simulations suggest there's only a 2 percent chance a decisive state will have a vote close enough to trigger a recount. And the chance of that winner of the popular vote will be different from the winner of the electoral vote is between one-tenth of a percent and zero. We had a smashing success running our live debate companion during the candidate face-offs. People were able to participate in real time and get insights from our public radio luminaries. 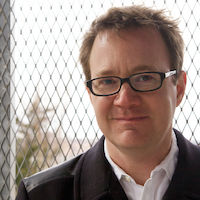 On election night, what's the right way to have people involved? Set aside a key hour for a similar chat? When would that be? Have it open all night? Would that be a valuable experience? Better to have a running blog of updates? On this, we're open to input. Comment below if you have any thoughts. 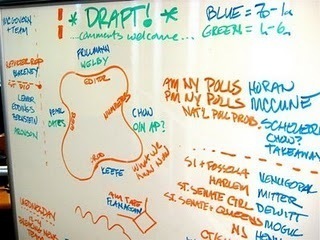 UPDATE ... Our digital election team met today and decided to run the Live Election Companion, with participation from our on-air hosts, from 8 p.m. to 11 p.m. on the WNYC and The Takeaway websites. Our newsroom works. Which is news. 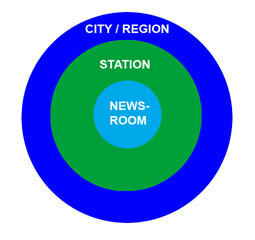 For three years, we tried to design, from scratch, the best radio and online news facility possible. We moved in this summer, and the recent debates and breaking financial news suggest we got pretty darn close. In a breaking news situation, nobody should need to move. 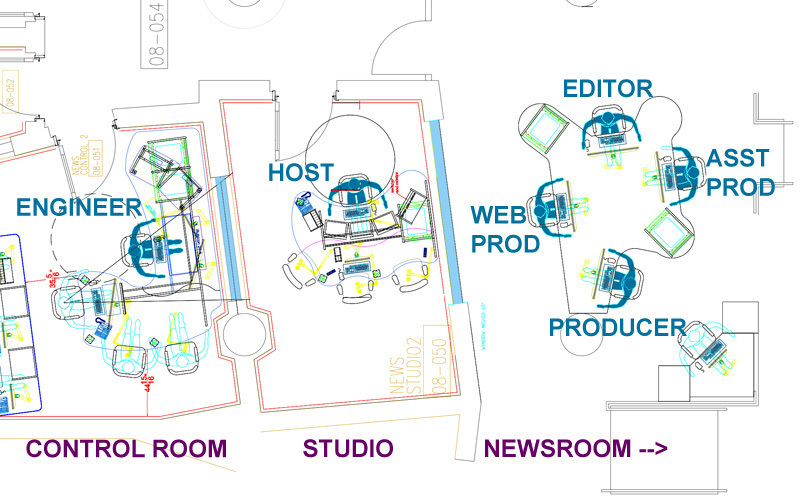 -- The News Hub is a technical extension of the studio complex, and has the intercom system used to talk directly with hosts and engineers; conversely, the hosts can address the entire newsroom through the News Hub monitor speakers to request facts, pronouncers, even water. It's not perfect. 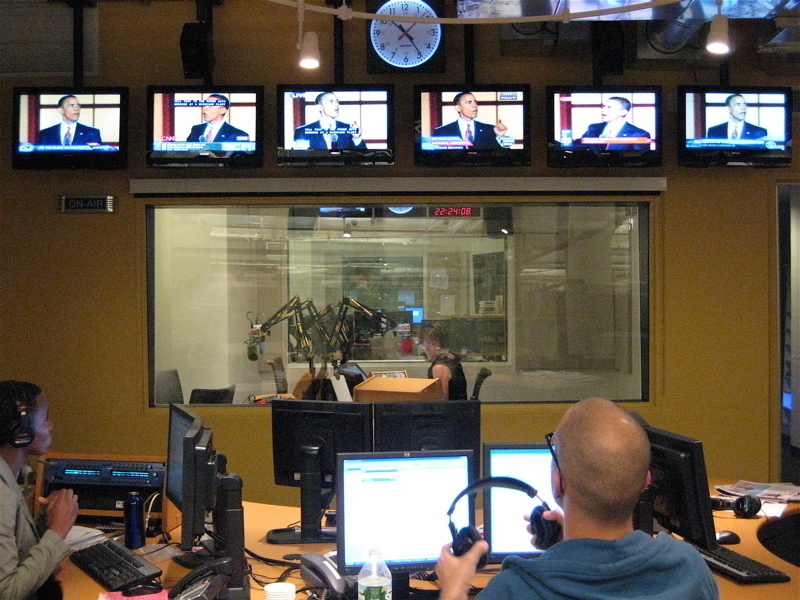 We produce two news shows on two different frequencies in the morning, and have trouble monitoring both at the News Hub. And our beautiful sightlines become tough brightlines as the sun sets beyond our western windows. But those panes do provide an unexpected feature for hosts and the entire newsroom: ambient warning of approaching storms.